Dr. Barbara Irish was born and raised in Flint, Michigan, the youngest of four children. Dr. Irish obtained her undergraduate degree at the University of Michigan in Ann Arbor. Majoring in Cellular and Molecular Biology, she earned her Doctor of Medicine degree in 1991. During medical school, she was elected to Alpha Omega Alpha Honor Society, the national medical honor society. After medical school, she completed a medical/surgical internship at St. Joseph Mercy Hospital in Ypsilanti, Michigan. She continued her postgraduate training in Ophthalmology at the University of Michigan Kellogg Eye Center where she was elected their first female chief resident and received the Walter R. Parker Resident Teaching Award. During Residency she was involved in the early trials of the Femtosecond Laser which is currently used in modern LASIK surgery. After residency, Dr. Irish moved to Reno and began practicing Ophthalmology in 1995. 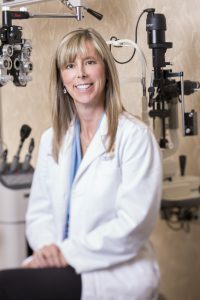 She joined Nevada Eye Consultants in 2004 and specializes in Medical Ophthalmology, diseases that affect the eye such as Diabetes, Glaucoma and Age Related Macular Degeneration. Dr. Barbara Irish is Board Certified by the American Academy of Ophthalmology. She is married to Dr. Matthew Hoberg, a local Anesthesiologist. Together they have 3 sons and 2 dogs. When she is not in the office, she enjoys running, cycling, and skiing.